Thinking about a hanging swing, the Harlow Rope Hammock Swing Chair will be a great solution for inside or outside use. The cotton fabric and stainless steel hardware will give you protection from the outdoor elements. Add in the included seating cushion you will enjoy hours of rest in this hammock. 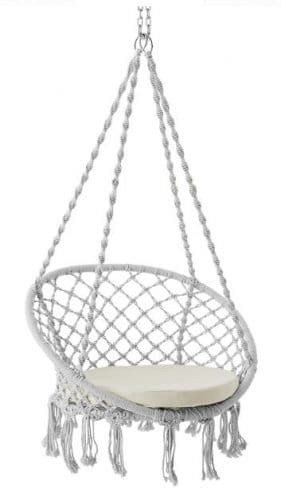 This swing will be a great addition to your outdoor space or just add to the kids room for a place to read a book. If you would like to look at more of my hanging swing ideas, follow this link. You will get a fully assembled swing with hanging hardware and cushion. The swing is a woven cotton macrame finish over a stainless two round steel frames. Lower fringe is cotton rope that is tied to the bottom ring. 1 1/2 inch thick cushion for the seating area is round to fit the shape of the bottom ring. No ties are used to hold cushion in the chair. Twisted rope will hang this swing from two stainless steel rings, each side the ropes are attached to a ring. This will allow you to choose what style of swing you want. A true swing, you will hang each ring about the width of the bottom of the swing. To have a swing that pivots and swings, hang both sides to the same mounting point in the ceiling. The base circle is 32 inches wide and 24.5 inches deep. The swing will hang down 48 inches from the mount. The mount will determine the amount of weight this swing will hold. With a solid mount the swing is designed to hold 265 pounds of weight. You must find a solid mounting surface for safety for this or any other hanging swing. This swing will be great for indoor or outdoor use. No assembly, take out of the box and find a place to mount to the ceiling, add the cushion and relax. At under 7 pounds with out cushion, your swing will be easy to move to storage area when not in use. If you use this swing outside, you will need to store the swing and cushion out of the weather when not in use. The cotton macrame and cushion will not tolerate rain or sun very well for extended periods of time. For some of my storage solutions, look at my post here. Cleaning the cotton material and cushion should be done with a cloth using a mild soap and water mixture. The cotton material does not do well with a lot of water so be careful when cleaning and do not soak with a lot of soap that will need water to rinse off. I would recommend the Harlow Rope Hammock Swing Chair for indoor or out door use for your home. The mounting will be your only assembly, two choices will face you when you are mounting your swing, a straight swing or a rotating swing. I would recommend a storage solution for your swing if you mount outside in the weather, if you hang on a covered porch no storage will be needed. I have written several post on hanging swings with frames and without. See other choices of patio hanging swing in my series of post here. 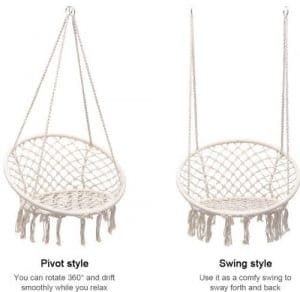 If you like this swing and want a cheaper version without the cushion it is available, just follow the above link to Walmart. If you have used this swing or have one like it, let me know in the comments. Any questions or comments use the form below and I will get back to you shortly. Thanks for coming by, if you have any questions for me, don’t be afraid to ask. If I do not have the answer, I will find it. I remember that I was looking at a few swing sets at your site. This chair looks nice as well. Thanks for the recommendation. This swing will be more of a swing for one person than the others. Having a good book and a cool drink nearby will be all that is needed for a rest after a long day at work. That looks like one comfortable hanging swing chair. At 265 lbs it looks like two people cannot canoodle in it, which is a shame. What about the safety aspect if a child uses it to swing, will they be safe from harm. The hammock swing chair will only support the weight that the mounting system will allow. The ceiling mount will be what will allow you to swing or swivel. A child should have no problem unless they get really wild with their swing.